There are many factors that contribute to having a “double chin,” or excess fat below a person’s jaw line. Genetics, extra weight and drooping skin from aging all may be causes. To remove this unsightly problem, the FDA has approved Kybella, a revolutionary new injectable treatment. Made from deoxycholic acid, a naturally occurring molecule, Kybella targets and removes the fat cells in the chin area, creating a sleeker, slimmer jaw line without an invasive surgical procedure. As one of the first Kybella providers in Boston, Dr. William LoVerme is proud to offer this advanced cosmetic treatment to his patients at Accurate Aesthetics Plastic Surgery. 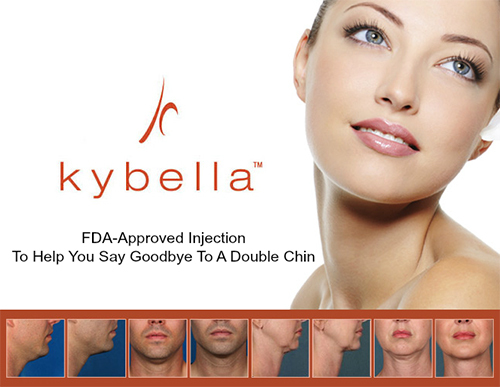 Upon injection, Kybella® disrupts the membrane of the fat cells in the chin area, causing them to burst and then be absorbed into the body through a painless and natural process. These fat cells, once removed, cannot return to the treatment area. This means that there is little to no more fat storage in the chin area, resulting in an attractive, well-defined jaw line. Typically, a Kybella® treatment plan consists of two to six sessions of injections, each of which are spaced between four to eight weeks apart. Each session lasts 15 minutes or less, in which time Dr. LoVerme will use a small syringe to inject the substance into the chin, in the most fatty areas. And since Dr. LoVerme applies a topical numbing agent to the area before injection, the session is painless and easy. There are no bandages needed after treatment, and patients will usually experience a slight redness and irritation on the treatment area. There may also be slight swelling, which typically lasts no longer than a few days. Though the chin will most likely be sensitive to the touch for a few days, there is little downtime after a Kybella session, and patients are generally able to return to normal daily life, including work and exercise, after a couple of days. Most Kybella® patients begin to notice an improvement in the contour of their jaw after one month. The melting of chin fat becomes more markedly noticeable around the three-month mark, or after three or four Kybella injection sessions. Depending on the anatomy of the patient, it may take up to six sessions to achieve the aesthetic results that they are after, but these beautifying results can last for years! Curious if Kybella® Can Help You? If you’re tired of scowling at pictures that highlight the fat under your chin, or of looking for clothing to hide your double chin, but to no avail, why not find out more about the Kybella® non-surgical treatment? Kybella® is a safe and effective alternative to more invasive procedures, such as liposuction, to rid your jaw line of extra fat — and the treatment involves no pain and almost zero downtime! If you’d like to look younger and thinner instantly, contact Accurate Aesthetics by calling (877) 603-7874 toll free to learn more about our Kybella® treatment.